Papaver somniferum subsp. setigerum L.
It is believed that our population mostly consists of Papaver somniferum subsp. setigerum (sometimes found as P. setigerum), which is generally a smaller plant with smaller fruit capsules, and short britsles. The other subspecies is Papaver somniferum subsp. somniferum (the cultivated Opium Poppy) and has a large fruit capsule and more glabrous. Fields (esp. barley and wheat fields) disturbed grounds, waysides, and soily wasteground. Scattered numbers throughout Malta and Gozo in fields, countrylanes and waste soil. Examples include Mistra, Qormi, Rabat and Ghajn Tuffieha. Not as common as the Field Poppy. Possibly, if taken in excess. This poppy has few different characteristics from other poppy species. Like poppies it is an erect plant, with single terminal flower, but the stem is hairless and smooth, except at the upper part (near the flower) where there are sparse white bristles. The sessile leaves are not much deeply lobed as the other wild poppy species in Malta. Additionally, they are bluish green in colour and more fleshy then its relative species. Their shape is roughly oblong to linear or lanceolate with shallow teeth-like lobes. The margin is dentate and serrate (like a saw). Sometimes. there are few white bristles on the midrib of the leaf. The alternate leaves are not spread out but grows at an acute angle (approx. 30 degrees) to the stem, and looking at the plant sideways, one would see the lower side of the leaf. The flower's shape and anatomy is similar to other wild poppies, except its colour, which is purple/mauve or lilac. Each of the 4 circularly-shaped petals have a dark purple blob at their base. The petals are very flimsy, and fall off with a slight shake. The stamens, which usually have a black filament and pale yellow anthers, are present in clusters around the central ovary, which is green and glabrous (sometimes shiny). Like other poppies, the flower bud is a peduncle (hanging upside-down) and made up of 2 ovoid bristly sepals. When the flower blooms, the sepals falls off and the flower takes an erect position. The fruit is a an poricidal dehiscent operculate capsule, which is glabrous, green with a rather yellowish lid, and quite spherical in shape. When it ripens and dries, its tiny, kidney-shaped, dark brown seeds escape from tiny slots in the upper part (lid) of the capsule. The native land of the plant is believed to be Asia but pictures of poppy have been found on the islands of Crete, dating back to the ancient Greek culture. It is also on the list of medicinal plants in an Egyptian papyrus from 1500 BC. It is believed that the Romans probably learned of opium in the Mediterranean. Opium spread to places all over the world. In China opium was reported as a problem during the seventeenth century. Between World War I and H the cultivation of opium grew in Central America in the mountains. Now the major producers and exporters of opium are Turkey and India. 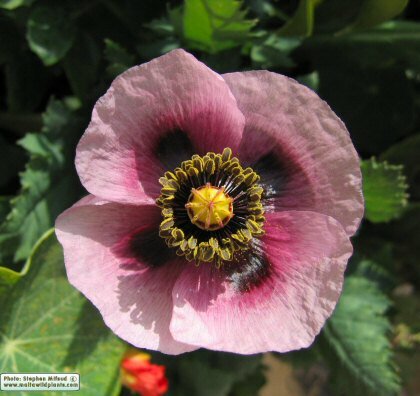 [WWW-19] An excellent abstract regards the history of the Papaver somniferum is this one below taken from the website "Poisonous plants and animals" [WWW-20]: The poppy is the oldest intoxicating plant in the human history. The plant is an annual, about 1.5 m high. It has white, pink or violet blossoms, and a specific unpleasant smell. Its every part, except for the seeds, contains a white milky resinous liquid, which is, in fact, the raw opium. It is gathered from the plant early in the mourning, kneaded into small flat loaves and then dried. Turkish warriors always went to battle intoxicated and nothing could stop them. The plant was also popular in India, Taiwan and later in China, where more than 120 million people needed opium in 1878. The desire for tranquility and sweet dreams over and over again led to numerous poisonings. At first, sleepiness appeared, followed by weakness, contracted eye pupils, lower body temperature, and faint breathing. If the dose is high, all this will result in coma. This lasted until 1805 when a German pharmacist extracted an alkaloid and named it after the Greek god of sleep Morphaeus. It was the first alkaloid which possesses narcotic properties. Morphine is one of the strongest painkillers ever known-a soporific tranquilizer. One who has taken morphine forgets all about hunger, fatigue, grief, and fear. The poison has turned to a medicine but a medicine can also turn to poison. Morphine saves patients from pain but not from the disease, so they need more and more morphine. The symptoms of poisoning are nausea, vomiting and depression. Then come dizziness, dry mouth, breathing disruptions and decreased blood pressure, usually with an unfortunate end. Anyway, millions of people in the whole world still find relief from the pain in this poisonous cure, morphine. Later, scientists found more than 20 other alkaloids in the opium. The most important ones are codeine and papaverinum. Codeine is a common ingredient of medicines against cough, whereas papaverinum is a popular painkiller of stomachache; it also controls blood vessel spasms. Seed: - raw or cooked [2, 14, 15]. Much used as a flavouring in cakes, bread, fruit salads etc , it imparts a very nice nutty flavour [KF]. The crushed and sweetened seeds are used as a filling in crepes, strudels, pastries etc . The seeds are perfectly safe to eat, containing very little if any of the narcotic principles [10, 65, 238]. The seeds are rather small, but there are large numbers of them contained in capsules 3cm or more in diameter and so they are easy to harvest and utilize [KF]. Edible young leaves - raw or cooked . They must be used before the flower buds have formed. One report says that the leaves do not contain any narcotic principles . Some caution is advised, see notes at top of the page. Seed Oil: A high quality edible drying oil is obtained from the seed. It has an almond flavour  and makes a good substitute for olive oil [21, 46, 57, 89, 183]. * The difference between Sedative, Hypnotic and Narcotic can simply lie in the dose of the administered drug. As the name of the plant suggest, the main use of Opium poppy is the extraction of an important compound called opium. Opium is largely used for manufacture of morphine, codeine, narcotine, laudenine, papaverine, and many other alkaloids. It is also the source of the toxic and extremely habit-forming narcotic heroin or diamorphine, prohibited in some countries. [WWW-16]. Another source [WWW-18] states that opium contains a mixture of sixteen or more different alkaloids, with Meconic acid, coloring matters, and various inert substances. The principal constituents are the following alkaloids: Morphine, C17H19NO3 + H2O. codeine, C18H21NO3 + H2O (both official); narcotine, narceine, paramorphine, papaverine, meconidine, pseudomorphine, codamine, laudanine, and oxynarcotine; these are in combination with Meconic and, thebolactic acids. Mineral constituents average about 6 per cent. The opium poppy contains a wide range of alkaloids and has been a very valuable medicine, especially useful in bringing relief from pain. Its use (especially of the extracted alkaloids opium and morphine which it contains) can become addictive, however, and so it should be treated with extreme caution and only be used under the supervision of a qualified practitioner . The dried juice (latex) from the unripe green seed vessels is a rich source of the active alkaloids, including morphine [232, 240]. It is extracted by making shallow incisions in the capsules as soon as the petals have fallen . Care must be taken that the incisions do not penetrate to the interior of the seed capsules . The latex exudes from the capsules and dries in contact with the air - it is then scraped off . This latex is anodyne, antitussive, astringent, diaphoretic, emmenagogue, hypnotic, narcotic and sedative [4, 7, 13, 176, 192, 218]. As well as its pain-relieving properties, the latex has also been used as an antispasmodic and expectorant in treating certain kinds of coughs, whilst its astringent properties make it useful in the treatment of dysentery etc . A homeopathic remedy is made from the dried latex . This is used in the treatment of a variety of complaints, including constipation, fevers and insomnia . Egyptians claim to become more cheerful, talkative, and industrious following the eating of opium. When falling asleep, they have visions of "orchards and pleasure gardens embellished with many trees, herbs, and various flowers." Lebanese use their opium wisely; to quiet excitable people, to relieve toothache, headache, incurable pain, and for boils, coughs, dysentery, and itches. Algerians tamp opium into tooth cavities. Iranians use the seed for epistaxis; a paste made from Linum, Malva, and Papaver is applied to boils. In Unani medicine, the fruit is suggested as well for anaemia, chest pains, dysentery, fever, but is correctly deemed hypnotic, narcotic, and perhaps harmful to the brain [282,] . The plant provides a narcotic that induces sleep; a sleep so heavy that the person becomes insensible. When the Roman soldiers at Golgotha took pity on their prisoner on the cross, they added this poppy juice to the potion of sour wine. Jewish authorities maintain that the plant and its stupefacience were well known among the Hebrews more than 2,000 years ago. The Jerushalmi warns against opium eating. Although the seeds contain no narcotic alkaloids, urinalysis following their ingestion may suggest the morphine or heroin addict's urinalysis  . The main use of the Papaver Somniferum is extraction of Opium, but it has also other different uses, especially the opium-free seeds. Seeds are used extensively in baking and sprinkling on rolls and bread. Seeds are a good source of energy. They are also the source of a drying-oil, used for manufacture of paints, varnishes, and soaps, and in foods and salad dressing. [46, 57, WWW-16]. The seed yields 44 - 50% of an edible drying oil . Very good for lighting, it burns for longer than most oils . Oil cake is a good fodder for cattle. Lecithin has been extracted from poppy seed meal. Seedlings are eaten as a potherb in Iran. Seeds used for preparation of emulsions (white-seeded varieties preferred); the bluish-black varieties are generally used for baking. Prefers a rich well-drained sandy loam in a sunny position [4, 200]. Requires a moist soil  but does not do well on wet clays . Prefers a sandy loam or a chalky soil . Plants often self-sow in British gardens. The opium poppy is a very ornamental plant that is often cultivated in the flower garden . There are many named varieties, some of which have been developed for their edible uses . The plant is widely grown, often illegally, in warm temperate and tropical climates for the substances contained in its sap. These are often used medicinally as pain killers, especially in the treatment of terminally ill patients suffering extreme pain, they are also used for their narcotic effects by some people. These substances are highly addictive and lead to a shortening of the life span if used with any frequency. In cool temperate zones the plant does not produce sufficient of the narcotic principles to make their extraction feasible  and cultivation of the plant is perfectly legal in Britain [KF]. Plants have ripened their seeds as far north as latitude 69�n in Norway . Members of this genus are rarely if ever troubled by browsing deer or rabbits . The organic compounds : lecithin, 2.80%; - oxalic acid, 1.62%; - pentosans, 3.0-3.6%; - traces of narcotine and an amorphous alkaloid; - carotene is absent. Some of the fungi attacking opium poppy include the following species: Alternaria brassicae var. somniferi, Cladosporium herbarum, Erysiphe polygoni, Fusarium scirpi var. caudatum, Heterosporium echinulatum, Macrosporium papaveris, M. bresdolae, Mucor mucedo, Ophiobolus sativus, Oidium erysiphoides, Peronospora arborescens, P. papaveracea, Rhizoctonia solani, Sclerotinia sclerotiorum, Trichothecium roseum. Plants are also attacked by the bacteria Bacillus (Erwinia) papaveri, causing bacterial blight, and Xanthomonas papavericola. The following nematodes have been isolated from the opium poppy: Ditylenchus dipsaci, Longidorus maximus, Meloidogyne sp., Pratylenchus crenatus, P. penetrans, and P. pratensis. Photo of the violet-mauve, cup-shaped flower. Top view photo of the flower made up of 4 large violet petals each with a dark blob at their base. At the centre there is the pot-shaped ovary with 8-10 ridge-shaped, linear stigma. Photo of a flower which have a conspicuous central ovary encircled by a brush of black stamens. Side-view photo of flower also showing the flowering stalk having several white bristles. The bud assumes an upside-down position and straighten up when the flower is just to blossom. Photo of flower and fruit. Side-view photo of photo of flower made up of 4, large, erect petals which overlap and form cup-shaped flower. Top view photo of flower. The large, dark-purple, blotch at the base of each petal, makes the flower appear to have a painted cross. This beautiful flower usually lasts for 1-2 days only. Close up photo of the central part of the flower showing its reproductive parts - a large ovary surrounded by a ring of stamens. Close-up image of ovary and stamens. This specimen has 10 stigma ridges, hence demostrating that the number is not fixed but variable between (7-)8-10(-11). Close up photo of the ovary and stamens. The ridged stigma at the top of the ovary are purple but often covered with yellow pollen. Photo with of flower and an one of its inhabitants - a large hairy beetle. While roaming inside the flower the beetle destroys the fragile stamens found around the central ovary, and so hinders the pollination process. Scanned image of 2 petals showing clearly the large dark purple spot at the base of the petals. Scanned image of 2 buds. They assume an upside down position and becomes erect just before blossoming into the flower. Scanned image showing in detail the numerous cluster of stamens. They consist of black anthers and pale yellow anthers. Magnified scanned image of stamens. Scanned image of ovary and some stamens. The ovary is pot-shaped, glabrous, and green in colour, with a yellowish lid and a purple-brown ring just under the lid. Photo of several plants and their oblong leaves with serrate-dentate margin. Photo of plant including flower and upper leaves. Photo of several plants. Leaves are grow at an acute angle with the stem (about 30-45 degrees). Photo of plant including leaves, buds and the solitary purple flower. Photo of another specimen found at the University of Malta. Scanned image of a young and adult leaves. Similar in structure except their size. Scanned image of an adult leaf showing clearly the teeth-like lobes it possesses and the serrate (saw-like) leaf margin. Scanned image of a leaf blade and a shoot growing from its axil. Scanned image of several leaves. Scanned image of a young leaf with new flowering stems growing from their axil. Photo of fruit pod in situ. Scanned image of fruit-pod showing in details its anatomy (side view an top view). Photo of a fruit capsule. Ripe seeds will escape from tiny slit-shaped openings at the top ('lid') of the fruit. Photo of fruit pods after making small incisions to make sap ooze out. The sap is rich in opium. Scanned and magnified image of the tiny, kidney-shaped, brown seeds. Seed coat have a 'wrinkled' texture. Colour illustration of the plant and its main parts taken from © 1995-2005 Missouri Botanical Garden.. Illustrated is the white or red form which is not found in Malta. Colour illustration of the plant and its main parts taken from Thomé - Flora von Deutschland, Österreich und der Schweiz. In Malta the violet form is found. As this photo shows, the Opium Poppy makes an elegant pot fowering plant.